My recent trip to West Africa was what I billed as a “working vacation.” The vacation part was visiting my daughter and her family who have been working in the country for past eight years. The working part was my time in observing the culture. Here are some observations from my three-week working vacation. RELATIONSHIPS ARE KEY - Both my son-in-law (referred to following as A, and my daughter are gifted in genuinely being interested in people. They live in a part of the city that is not fancy, surrounded by half-built houses and many people in the neighborhood don’t have the basics of life, i.e. decent shelter, running water, electricity, etc. The streets are sand, littered with trash and the extreme heat makes for a challenging living environment. (Full disclosure, my kids live in a nice house and their yard is full of trees and flowers, but that’s due to A’s gift and diligence in making the desert bloom). Twenty-feet outside their compound is a bunch of guys who drive horse carts for a living. 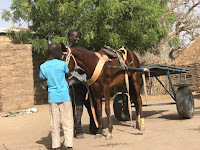 Several years ago Musa, a village guy, moved across the road with his horse and cart. He speaks no French, only Wolof. Because his father died when he was less than five years old, Musa grew up as a Talibe boy. (https://en.wikipedia.org/wiki/Talibe). 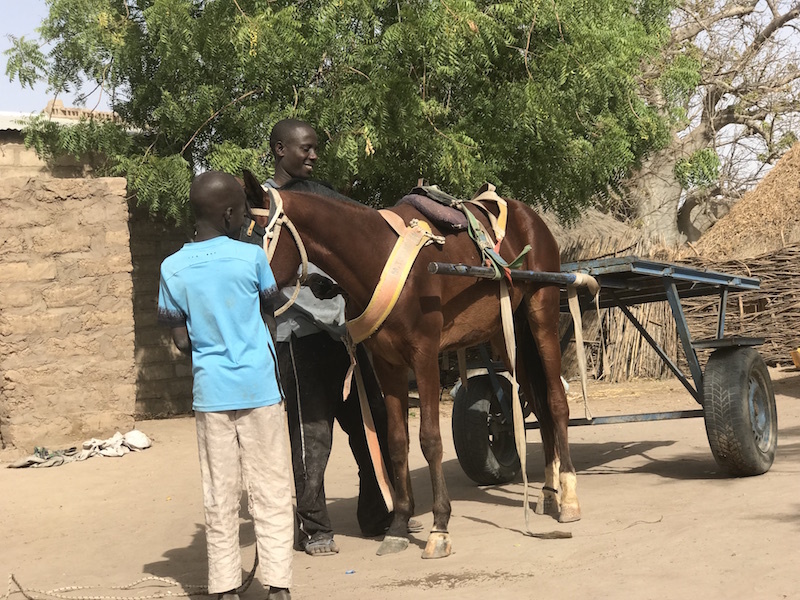 Because he was a Talibe kid, Musa doesn't know how to read or write, as the main reason for the school is to recite the Quran in Arabic, which no one really understands or uses outside of their religious rituals. Over the years A has built a real friendship with Musa. A tells the stories of how over time more horse guys from Musa’s village moved across the road, how that often A would sit and visit them at night, drinking tea, laugh and joke with each other. There was a time when one of the horses got sick and A and my daughter visited them and PRAYED FOR THE HORSE to get better! The horse eventually died, but that’s beside the point. My kids are interested in people and because they are genuinely interested and demonstrate their care for others the relationship between my kids and the horse guys (and now their wives and children that have immigrated across the street) grows. Sometime back Musa asked A to visit his village which is 200 hundred kilometers away from the city. I volunteered to go with A because, even though I don’t speak French or Wolof, as teacher and student of culture I at least could be a participant observer and learn some things. It also gave me a chance to be around A and my grandson. My son-in-law enlisted a guy he works with, Ernest, who speaks English, to go with us so I wasn’t completely in the dark. “Why is A different” he asked? Musa nodded, no doubt not really understanding my answer, but that’s okay. Musa’s question to me was years in the making. A has given all the horse guys a solar recording of the Gospel, which they listen to all the time. 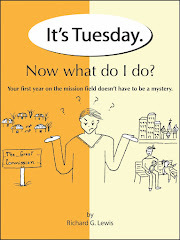 Though Musa’s question came as a surprise to all of us, it was born out of the many days and nights of A and the whole family being good neighbors, caring for people and just being, what we call, salt and light, in the mundane workings of life. I tell my students regularly that the key to bringing people to understanding the Gospel is not through big programs and using all types of methods or gimmicks for evangelism. Most people become followers of Christ through having and building trust and relationships with others. Will Musa become a follower of Isa as his friend A? Obviously no one knows, and quite honestly, that should not be our greatest concern, for you see, salvation belongs to the Lord. What we do know is that Musa and his family doesn’t have a chance for salvation without someone being truly interested in them, talking with them as a good neighbor. Musa is not as an object for evangelism for my son-in-law and daughter, they just love people and that sets them apart from others, and it shows and has an impact. Simple things, like our Lord said, “Whenever you did one of these things to someone overlooked or ignored, that was me—you did it to me” (Matthew 25:35-40). Humanly speaking, Musa has a steep climb from being a cultural Muslim to a follower of Isa. The “prison of disobedience” (as my friend Shewood Lingenfelter refers to) is their family structure, which is major barrier for Musa in making that eternal decision. However, down through the ages God has brought people to Himself in spite of the obstacles, so we have hope. Relationships, being truly interested in others, that’s what makes A and the family different from other toubab’s. Coupled with the love of Christ and the work of the Holy Spirit, people find their way to the true and living God, one person at a time.